Thanks to some high quality pictures from Erik (I hope I got the name right), we can now visualize a suspect carbon steerer failure in high resolution. 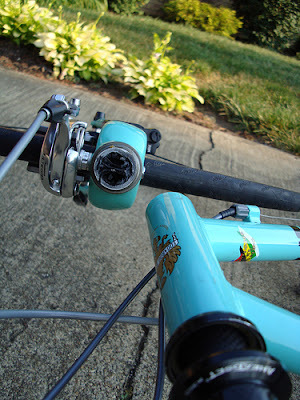 The bicycle is a Bianchi Virata, possibly from the company's 2006 lineup. Some pictures of Erik's injuries can be viewed here (since he's made the page public). Lets hope he has fully recovered. I notice how the metal-cf bond has failed at the headset junction, and the fiber within has just snapped like straw. 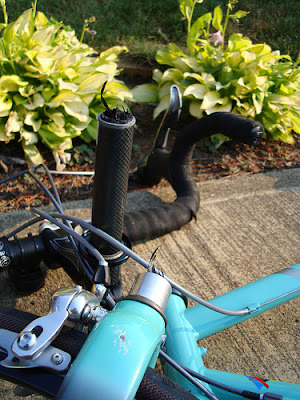 Honestly, I do not have a lot of composite experience so I cannot really tell you how this fork failed. Only Erik knows best what he did with the bike before this happened. We can sit here and postulate too. But I'll be posing this question to some composites experts. Understanding this culprit is vital for my brain's health. Composites consist of a combination of materials - a matrix and sheets of short or long fibers. Each of these two have their own characteristic properties and when combined together and designed well, they take care of each other's weaknesses and yield a high strength composite having properties like no other conventional material. This is called complementary nature (sum of parts is greater individual parts). 1. Aspect Ratio , defined as length divided by cross sectional diameter. Fibers can be long or short and each of them have advantages and disadvantages. 2. Ply orientation. A ply is basically a strand or layer of carbon fiber and how you orient it in your design will speak of how it'll perform in real world. Orientation depends on structural application for example, a golf club shaft. Pictures courtesy of a University Webpage. 3. Choice of fiber and matrix. 4. Choice of manufacturing method. This is why composites are so attractive. You can tailormake them to give specific properties in specific regions. They are also tremendously lightweight and strong anisotropically. Composites are also a funny material. They are great for on the edge, performance based design. But theydon't show warning signals before failure (unlike metals), and are infamous for snapping catastophically. You can read all about composites on the left hand portion of this page. 1. As much fiber as you can cram into the piece, but not a whole lot such that dry fiber results. 2. Delamination and failure can also happen without an appropriate percentage by volume of fiber. The above pictures could reflect a manufacturing defect (such as leaving voids, using less resin or fiber etc), or just outright negligence of design principles such as factor of safety, laterial and longitudunal loading conditions (including impacts and those damn bumps on the road). Either way, its a failure of engineering ethics. 1. Composites are a very specialized field. Good design with composites takes years of experience and learning. 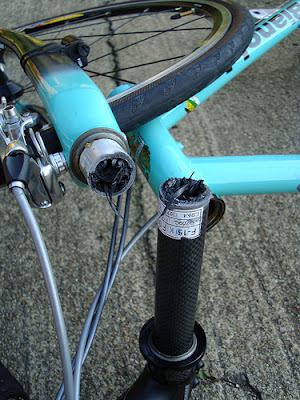 So do not buy unbranded bikes or forks from someone you do not know, for example, Ebay. 2. 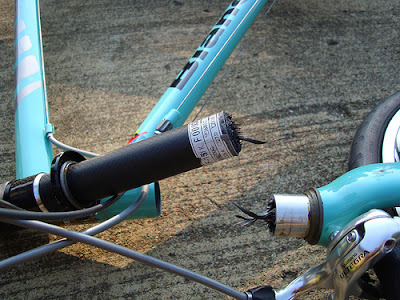 Don't laugh the next time you see a warning label on your handlebar or seatpost. They are there for a reason so READ instructions and tightening values carefully! 3. Check your carbon fiber equipment at all times. Look for any suspicious (if not tiny ones) scratches and nicks. They can be stress risers for the material. Be attentive to weird noises as you ride. Use a coin and gently tap the surface for variations in noise. I know these are archaic methods, but if you can afford the latest ultrasound technology to detect duplicate echoes, go right ahead.